Law & Order: Los Angeles—or LOLA—returns tonight on NBC at 9 p.m. Eastern, with a two-hour episode. It will move to its regular timeslot, 10 p.m. Eastern, starting next week. One of the great things about the TV renaissance of the last 10 to 15 years is that it’s attracted a good number of genuinely great actors to the small screen, men and women who just aren’t finding the roles they want in the movie industry anymore and find the allure of a steady paycheck and strong writing too much to ignore. Even though TV is a medium that creates stars more than it tends to confirm them (meaning that it’s just as likely for a show to take off with virtually no one you’ve ever heard of as it is with a bastion of well-known actors), it’s a medium where actors looking for meatier material than they might find in the latest round of summer movie scripts have been able to find stronger stories and more deftly drawn characters. But there’s a danger to this, too. You could end up like a Gary Sinise or a Laurence Fishburne, trading in potentially intriguing movie work for a show where you repeat the same basic plot over and over and over until you go mad or your looks fade or you die or the show gets canceled. Law & Order: Los Angeles—now known officially as LOLA because that’s all that was ailing the show—seemed like it had found a way around this problem. 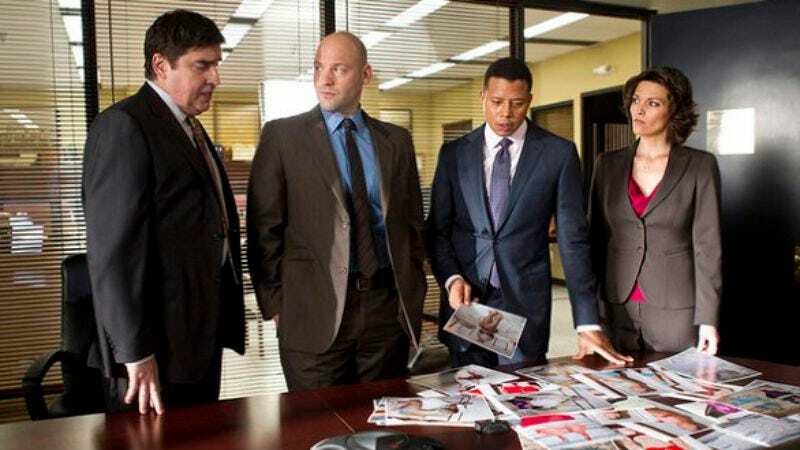 For starters, the Law & Order formula, while rigid in its own ways, has enough elasticity to allow for some room for truly interesting actors to play, unlike the more dour procedurals over on CBS. (The CBS formula has grown to encompass all of the procedurals on network TV, which may explain why NBC has had such trouble finding a procedural hit in recent years.) And the promise of LOLA was that it would have a variety of genuine movie actors on staff—starting with Alfred Molina and Terrence Howard—but it would alternate which of the two actors was the lead prosecutor from week to week, allowing for plenty of time off to pursue parts in films or stage work or whatever. Fortunately, Wolf’s tactics make for one of the most ridiculously entertaining—in a bad way—hours of TV I’ve seen in recent years. The first half of tonight’s two-hour return (which consists of two disconnected episodes that really have nothing to do with each other outside of a few spare lines of dialogue) contorts itself in ridiculous fashion to make sure that all of the actors it needs in different places by the start of the next episode are in the places they need to be. (If you’ve seen the promos for the show’s return on NBC, where Molina gamely attempts to explain just what his character arc is going to be, you already have some idea of how silly this all seems, but the way it actually plays out on screen is, somehow, much, much worse—but, again, in a ridiculously amusing way.) NBC’s promos are making no secret of the fact that a major shake-up is coming to the cast in this episode, and while I won’t spoil which characters are written out of the show to make room for the moves, it’s worth saying that the second half of tonight’s first hour is full of vintage bad TV logic, where characters come up against temporary obstacles and completely rewrite their lives, rather than trying to come up with a plan B. Also, tonight’s first hour hangs on a recent trend in TV writer stereotyping (especially in crime shows), where all Mexicans are just waiting for the drop of a hat to turn evil and either start slaughtering people or clamming up to protect the local drug cartel. (Considering all of this takes place in Los Angeles, the show has to stretch quite a bit to make it seem “local,” to the tune of bringing in a kid from Mexico itself—who doesn’t know he’s been shipped to California!—to be the key witness.) In true Law & Order fashion, I’m sure all of this is ripped from the headlines, and we’re supposed to feel OK about it because Molina’s character blusters about what’s been done to the country of his ancestors by the cartels, but by the time the fourth or fifth shifty-eyed Latino character who inevitably turns out to be evil turns up, you’ll either be howling with laughter at the obviousness of it all or vaguely irritated by the rich Hollywood writer-ness of it all. (Remember: These are the people who thought Crash a trenchant insight into the state of race relations today.) It stops just short of being actively offensive, but it’s still troubling. Yes, the cartels are a problem, but that problem deserves something more nuanced than what we get here, where the last straw is a character abruptly going bad, simply because of their national origin, rather than anything like real character development. Tonight’s second hour, at least, is better, allowing Molina a few chances to show why he’s been shifted into a new role within the show and do the slow burn he does so well, with a variety of characters. Is it one of the all-time great Law & Order hours? Absolutely not. The show’s formula is so worn down by this point that even a great story told in this format would likely feel old hat, and this story feels like a paint by numbers version of the franchise’s finest hours anyway, complete with a creepy and sexual home invasion plot, a person of authority who turns out to be no good, and a vague sense that all forms of sexual identity outside of good, old-fashioned heterosexuality are vaguely suspect and must be stopped (or at least kept to their own weird little corners). (The second hour also brings in a character from the final few seasons of the original Law & Order, in a way that’s almost as preposterous as the character moves in the first hour.) If you’re just looking for something that looks and feels like Law & Order to watch tonight, this second hour is likely your best bet, but at the same time, couldn’t you just find a rerun of the original series over on TNT? The franchise, at this point, needs something more than shifting great actors into parts where they can chew more scenery than they did before, and you can already see Molina and Howard’s eyes locked on the exit door.